If you’ve ever signed a contract for a book, as an author, a publisher, or a translator, do you know why it stipulated the terms that it did? Are you certain that it was the best contract for the book? And not the best contract for making money now, but for the long-term success of the book, of your literary legacy, of your organization? Petra Hardt, Foreign Rights Director at Suhrkamp Verlag in Berlin, has written a book to guide publishers in making the best choices regarding such essential questions. In an interview with Publishing Perspectives, she talked about Rights: Buying. Protecting. Selling., which recently appeared in English translation from Seagull Books. First published in 2007 by Bramann Verlag, Hardt says that she received an overwhelmingly positive reaction to the book in Germany: “Before, there was nothing like it. What’s daring about the book is how short it is.” Consisting of 87 pages of sensible and to-the-point advice on contracts, royalties, author relations, and other topics, the book is practical in the utmost. Another 40 pages is dedicated to sample royalty scales and contracts. Why is a German publisher’s perspective particularly relevant in developing markets? Well, it isn’t. But a successful independent publisher’s perspective is, since many publishers in developing markets may be emerging from or competing with state-owned publishers, or contending with large conglomerates from abroad. 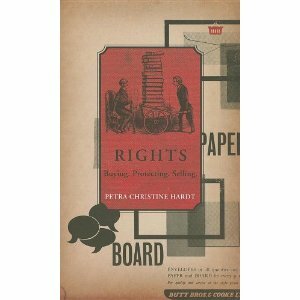 Hardt also counts on publishing translations of Rights with people who are expert in local book business, eg. Naveen Kishore of Seagull Books, publisher of Rights in English, who understands the singularities of Indian publishing. Hardt says her goal was to create “a basis for discussion. Of course, it doesn’t fit for every publisher.” Aimed at publishers of literary and academic works (like Suhrkamp), Rights will be less relevant for publishers of genre or entertainment literature. Much of Hardt’s advice is conservative regarding various recent trends in contract-making and royalties. Insofar as her intention was “to explain the Suhrkamp model and nothing more,” — and the Suhrkamp model is not one that has been formed by recent trends — this makes sense. As to digitization, “You can’t stop things from happening — and why would you want to? — but you can influence the way they happen,” she says. “It doesn’t matter what format it’s in, it has to be protected.” An updated edition of Rights will be published in 2014. More detailed, and about twice as long as the current one, the forthcoming edition will contain more information on the e-book market in particular. DISCUSS: What is the Appropriate Term for a Book Contract?